An emission of £100,000 legal tender bills of credit engraved and printed by Paul Revere in Boston. 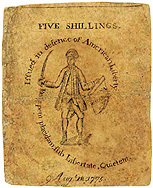 This was the first of four emissions of notes by Revere in his series featuring an American soldier on the back, often called the "Sword in hand" issues. In this August emission approximately 10,000 bills were issued for each denomination and were to be redeemable in "Lawfull Money" by one of three specified dates. A total of £40,000 was printed with a redemption date of August 18, 1778, another £30,000 with the date of August 18, 1779 and the final £30,000 was dated August 18, 1780. Some 17s and 24s notes were printed with the incorrect date of 1777, which was corrected to 1778 (some were corrected by hand before the plate was fixed). However, bills of 6s or higher from emissions before November 1776 were recalled for exchange by an act of October 13, 1777, which was amended three times, successively extending the date for redemption until December 1, 1778, at which time the notes became invalid and unredeemable. 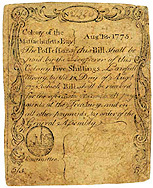 This was the first emission of Massachusetts printed currency for public use since 1750. 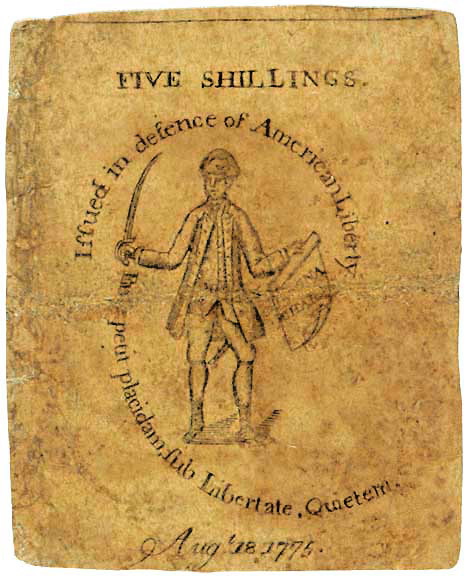 Revere's two earlier emissions of large sized engraved notes, of May 25th and July 8th, 1775 were authorized only for advanced pay for soldiers, hence they were called "soldier money" in contemporary sources. Once the soldiers were paid the Massachusetts Provincial Congress turned to the problem of paying a mounting public debt associated with expenses related to the war as well as tackling the problem of providing currency for daily business transactions. On July 6, 1775 the Committee of Safety recommended the Provincial Congress issue £100,000 in public notes. However the Congress was dissolved on July 19; but the matter quickly surfaced in the newly formed House of Representatives, which met in Watertown. On July 27th a committee report favoring the emission was brought to the House with the suggestion that a variety of denominations from one to forty shilling be printed. 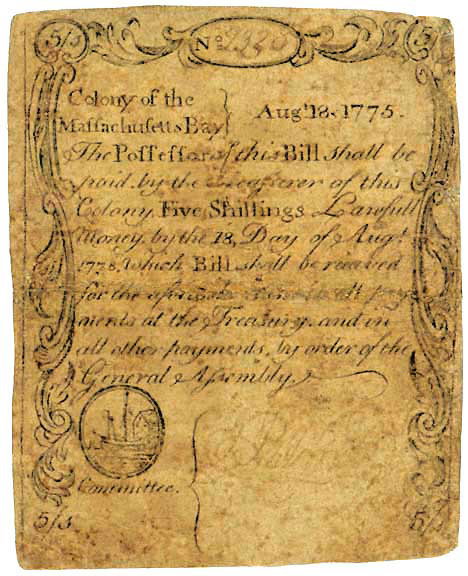 By August 4th the House procured the services of Revere while the final act authorizing the emission was passed on August 23rd, however the date on the notes is August18th, possibly the date the resolution was brought to the House. There were sixteen denominations in this issue printed from the two sets of newly engraved copper plates. The front of each note has a small oval vignette with a ship docked at a harbor or a tree; the design differs on each denomination. The back depicts a colonial American soldier (sometimes called a minuteman) with a sword in his right hand and copy of the Magna Charta in his left. This is a document signed by King John in 1215, popularly interpreted as conferring rights to all free Englishmen. Above is the motto "Issued in defence of American Liberty" and below is the motto of Massachusetts "Ense petit placidam sub Libertate Quietem." (By the sword one seeks peace under tranquil liberty). The copper plate used to print the front of the lower denominations (1s-8s) is extant in the Massachusetts State Archives; however as it was extensively modified for the second emission of December 7, 1775 it is discussed under that emission. Also, the plate for the back of the higher denominations does survive, but as it was modified for the final emission of this series, dated November 17, 1776, it is discussed under that emission. Revere appears to have work on this emission throughout September. The notes were needed as quickly as possible but it appears it was difficult to get the requisite number of committee men together to sign them. On September 22nd it appears 1,000 of the lower denomination sheets had been signed by two members of the committee and on that date it was ordered the remaining 9,000 sheets were to be signed by any one committee member. Likewise 4,000 of the higher denomination sheets (10s-40s) had previously been signed by three members of the committee and it was ordered the remaining 6,000 sheets were to be signed by only two members. All the bills were printed by October 17th for on that day the plates were placed in a chest and sent to the Treasurer's office. Finally, on October 20, 1775 Revere was paid £133 6s8d for making the plates, providing the supplies and printing the notes. Denominations for the December 7, 1775 issue were: 1s, 2s, 2s6d, 4s, 5s, 6s, 7s6d, 8s, 10s, 11s, 12s, 17s, 20s, 24s, 30s and 40s. Signers: J. Palmer (others faded). Comments: The oval vignette differs somewhat on each denomination. On this denomination is a ship docked at a harbor with a building to the right. The back depicts a colonial soldier with a sword in his right hand and a copy of the Magna Charta in his left. Above is the motto "Issued in defence of American Liberty" and below is the motto of Massachusetts "Ense petit placidam sub Libertate Quietem" (By the sword one seeks peace under tranquil liberty). Courtesy of Early American Numismatic Auctions, Inc. Images used with permission from their on-line auction catalog for the auction of August 24, 1996, lot 270.